Feminists have railed against it and some critics have even gone so far as to call it “fascist” but Fight Club is, according to its director David Fincher, essentially a “pitch black comedy”. Before embarking on the film, however, he had to check with his “collaborator in perversity”, actor Edward Norton, to confirm that the original novel by Chuck Palahniuk was actually as funny as he thought it was. “It’s about what happens when a bunch of fat guys take themselves too seriously” Norton surmises. In truth, the only really overweight chap in the film is Bob (Meatloaf), a testicular cancer survivor with seriously engorged mammary glands, who Norton’s character, Jack (for want of a better name) befriends at one of the many self-help groups that he routinely attends. Finding his life bereft of meaning at the turn of the millennium, Jack embarks on an odyssey that sees him faking all sorts of identities and illnesses so that he can feel better about himself by connecting with people much worse off. And he is not alone. A chain smoking freak called Marla Singer (Helena Bonham-Carter) is also addicted to these sessions and, in order to sustain their ruse, she and Jack must form an uneasy alliance that quickly deteriorates into a sexual relationship. Meanwhile, the increasingly unstable Jack has made the acquaintance of Tyler Durden (Brad Pitt), a seductively enigmatic bloke who manufactures and sells soap for a living…or does he? Squeaky clean he ain’t but Tyler is everything that Jack aspires to be; confident, powerful and incredibly good looking. 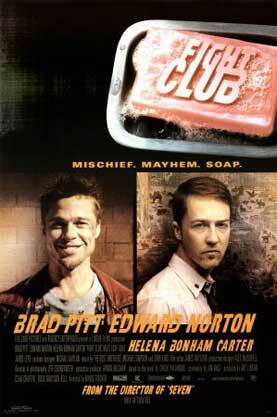 Tyler challenges Jack to transform himself into his own likeness by instigating the titular Fight Club – a secret gathering of men who bash each other to a pulp in order to claw back the masculinity deprived them for decades by the feminist movement and the benumbing consumer society in which they live. ‘Bring Back the Biff’ is the nihilistic battle cry here and the recent fisticuffs on Sydney’s Cronulla beach would suggest that it still has some primal currency.